That was pretty exciting, but it merely whet the appetite of users hungry for more functionality. So, what if you could run more than just 4 Android apps on Chrome OS? And Also could run them on other operating systems as well? A developer by the name of "Vlad Filippov" began working on it to stripped away the limits Google has imposed. He successfully figured out a way to bring more Android apps to Chrome, instead of just the four that are officially supported by Google. The bigger success was that when Filippov got Android apps to work on any desktop Operating System that Chrome runs on. 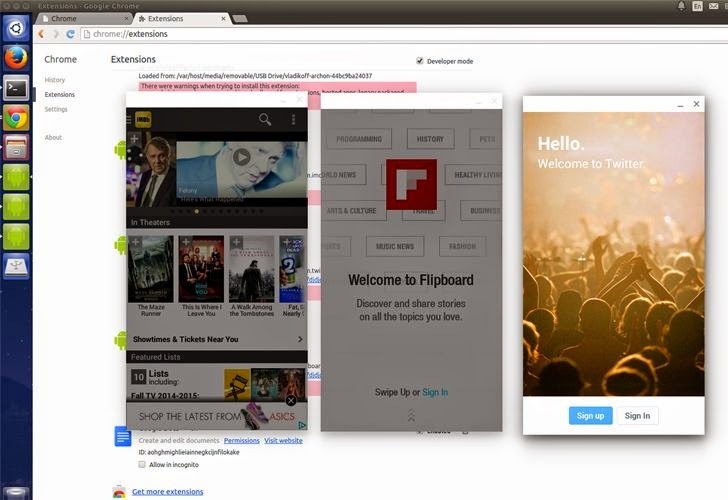 This means that now you are able to run Android apps on Windows, Mac, and Linux as well. The process uses App Runtime for Chrome (ARC) – a Google project that allows Chrome to run native code safely within a web browser. Since ARC was only officially released as an extension on Chrome Operating System, but Native Client extensions are meant to be used on different platform. So, in an efforts to do so, Filippov made a custom version of ARC, called ARChon, which supports both desktop Chrome and Chrome OS. However, there is one potential roadblock with the ARChon that it doesn't run Android app packages (APKs), which instead need to be converted into a Chrome extension. Now, that’s simply made possible by the use of "chromeos-apk", another Filippov’s tool, which as a result allows operating systems to support an unlimited number of Android APKs. Install Node.js and Filippov’s chromeos-apk tool on a Linux system (it’ll work on a Chromebook running Ubuntu in Crouton, so you don’t necessarily need a separate computer). That’s all !! Not every Android app will work. Some apps that have been confirmed to work include Pandora, Twitter, Soundcloud, and Skype — although you have to do a little extra work to make Skype work. Some other apps such as XBMC, WhatsApp, Firefox, Opera, and Spotify do not work yet. You can even keep track of which APKs have been tested in the Chrome-apk subreddit.